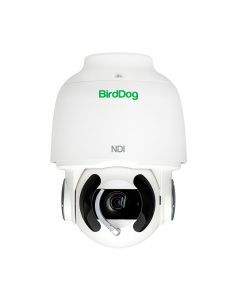 A200 PTZ camera utilises BirdDog’s custom NDI silicon chip and leverages an impressive Sony CMOS backlit sensor and full Sony Image Module. Designed for serious production the image quality of A200 is best in class. Built on a true Sony Image module with Sony CMOS backlit sensor, P200 has super fast focus, incredibly sharp images, and amazingly fast zoom. A200 has frame rates up to 1080p60, 30x optical zoom, and outputs SDI, HDMI, and NDI simultaneously. A200 is IP67 rating for outdoor and indoor use. Corrosion Resistant treated housing for salt spray environment. -40°C to +60°C operating temperature. It even has a rain wiper to keep water off the lens. 3.5mm audio connectors allow P100 to work with BirdDog Comms, the world’s first NDI audio intercom platform. Comms is a Windows 10 application that can run on any Windows 10 compatible computer, laptop, or surface for a touch screen experience. A200 has been designed for the most demanding on image quality. The superior optics make A200 perfect for Sports, Broadcast, Live Event Production, IMAG, Education, and any other application where quality matters. A200 is also compatible with BirdDog PTZ Keyboard for ultimate control. NDI is an IP codec that comes in multiple flavours. BirdDog P200 uses the full quality version. Full NDI is an i-frame, variable bit rate codec with an extremely high signal to noise ratio and is designed to run over existing Gigabit networks. The best pictures come from the best silicon. Combining BirdDog’s custom NDI silicon chip and a Sony CMOS backlit sensor is a match made in silicon heaven. Your productions deserve the best. IP67 rating for outdoor use. Corrosion Resistant treated housing for salt spray environment. -40°C to +60°C operating temperature for the harshest environments. A200 is compatible with BirdDog Comms. Comms is a complete Audio Intercom solution which can run on any Windows 10 compatible computer, laptop, or surface for a touch screen experience.